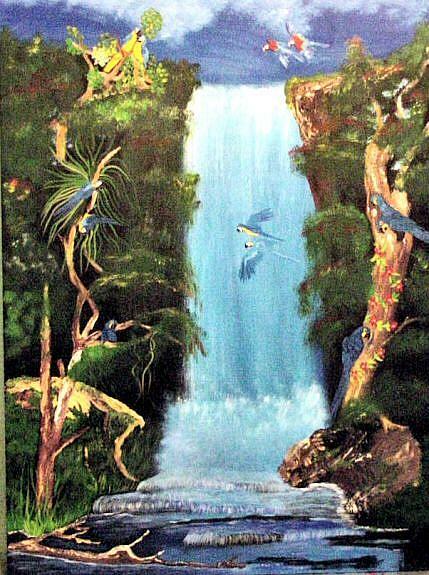 A very large, brightly colored painting of a wonderful waterfall flowing thru a dense tropical jungle into a stream with mini falls in the stream. 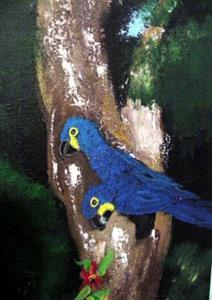 The jungle has nesting hyacinth macaws, blue and gold macaws and birds in flight coming in to roost. 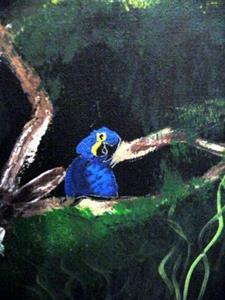 The painting is stretched canvas with sides painted so no frame is needed. It is sealed with non-yellowing professional artist's varnish, and comes with a certificate of authenticity that can be registered online as the original owner.